Image credit: Limina Edizioni srl. With the World Cup on the near horizon, I wanted to feature a book from a legendary figure of world football: Roberto Baggio. 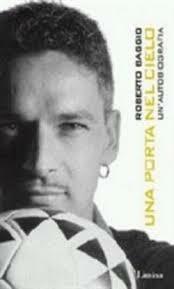 He wrote this autobiography, "Una Porta Nel Cielo" ('A Goal in Heaven') in 2001. I read parts of this book before each World Cup as a way to recall this extraordinary player's unique, if painful, place in the history of this fabled event. This book contained many topics from Baggio's life that had not been previously discussed in great detail. The autobiography had an interesting literary format: It appeared as a long interview between Baggio and an Italian journalist, Enrico Mattesini (who also published the book at his publishing house, Limina.) Sadly, Signor Mattesini passed away last year. Let's take a look at a few translated excerpts from this intriguing book. Baggio discussing his World Cup career with a Brazilian journalist. Roberto Baggio and President Ikeda in 1999. Fantasista, or the artistic player of your dreams. You find the highest praise aimed at our Roberto Baggio. No one else. And it is Baggio himself who admires the figure of Leonardo da Vinci and calls that Renaissance giant, a fantasista. But, what is the strength that allows a fantasista to be a fantasista? I met Roberto Baggio for the first time in June, 1993, in Tokyo. It was his gaze that struck me the most: A transparent gaze. One embellished with an iron-like warrior's will who fights to the very end. At the same time, his eyes radiated the humility of one who searches in life for a value that is far away from earthly glories. And a sincerity of one who wants to dedicate himself to others. I urged my young friend: Fight and fight to the very last instant! And he nodded with a smile and departed for the United States. It would be futile to comment once again about the eternal drama where he was the protagonist. The succession of miraculous goals by him, who lifted himself up more times than not despite a body that was full of injuries, brought the Azzurri to fight until the very last instant. His passion had to move the spirit of everyone. Long live the victory of a great king of football! I would have won or lost that World Cup at the last second. My spiritual teacher, Daisaku Ikeda, told me so. And he was one who couldn't be wrong. I thought about that phrase day and night, but that doesn't suffice to give a response. I asked myself what would happen, what development would unwind, how would that prophesy materialize. When I saw that ball go in versus Nigeria, it was like watching a risky shot in billiards. When I saw this, my World Cup began. I felt at peace on the inside and was replete with grace. My vital state was very pure. My burden was called Pasadena. Pasadena is the name of my prophecy. The years immediately following Pasadena were the worst. I wasn't myself. The burden made the dribbling of my childhood inconceivable. No, I have never metabolized it thoroughly. Because to lose on the pitch is one thing. To lose by a penalty kick is another. There would not be a celebration even after a victory. Because it's not a victory. Never. Who knows why that ball sailed so high. It would almost make you laugh, for one such as I, who had only missed a few from the spot. And those few were always stopped by the keeper. There was never a high shot. Never even in training sessions, not even on purpose, not even by accident. (Pages 5-7). I must say that phrase lifted my spirits a great deal. I felt so much responsibility on me. I was still the reigning Ballon d'Or winner and everyone waited for me to take off from one minute to the next. And against Norway, he subbed you out after 10 minutes? What bothered me wasn't so much the tactical choice because I'm not stupid. And I know that when a team loses its goalkeeper and goes down to ten men, the most natural thing is to take off an attacker. For goodness sake, you could have made that change from a tactical sense. What hurt me a great deal was the complete incongruence of what he told me the day before with what he did out on the pitch. "But how could you take me out at the first sign of difficulty? Well, I mustn't be as important as you told me." Sacchi subbed out Baggio when the Italians went down to 10 men versus Norway due to a an early red card on Gianluca Pagliuca. 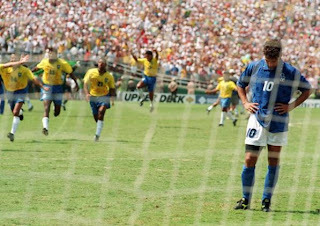 The Azzurri won 1-0, on a goal by Dino Baggio. When I walked up to the spot, I was relatively calm. As much as you could be in those circumstances. I knew that Taffarel always dived as I was well-acquainted with him. So I decided to shoot down the middle, at mid-height, a little more than a half a meter high or so. Because that way, Taffarel wouldn't be able to get to it with his feet. It was an intelligent decision because Taffarel actually threw himself to his left. And he would have never stopped it with the central trajectory that I had in mind. Unfortunately, and I don't know how, the ball rose up three meters and flew over the crossbar. The Brazilians said that the trajectory was assisted by Aryton Senna in heaven. As I've said many times, only those who miss penalty kicks are ones who have the courage to take them. That time I failed. Full stop. Ayrton Senna, the great Brazilian Formula 1 racing champion, tragically passed away in May 1994 at the San Marino Grand Prix at Imola. Buddhism is the foundation of my life. It's the most beautiful thing that I could have found and discovered. It is that which I entrust my life. From that 1 January 1988, you never stopped being an observant Buddhist? Has it ever happened that you converted somebody? Perhaps among some of your teammates? That is a question asked of me at other times. There is a strange curiosity surrounding this topic and also a little bit of ignorance. It's as if someone imagined that I was some sort of preacher who goes into training camps to defend his own word. Do you believe you will always be able to maintain self-control? Steve Amoia is a freelance writer and translator based in Washington, D.C. He is the publisher of World Football Commentaries and The Soccer Translator.